We have a good friend's 8 year old visiting us, and before his arrival I checked out Sneaky Art: Crafty Surprises to Hide in Plain Sight. Shira had to step out for part of today, which made it the perfect time to put the book to use. The idea behind Sneaky Art is to create whimsical little projects that will bring a smile to an unsuspecting individual. Just like this guy did at the entrance to the Pentagon. The book offers 24 different ideas to get you started on your career as a sneaky artist. The first project we tried was crafting a tiny sailboat. We cheated a bit, opting to use rubber bands and tape instead of glue to hold everything together. 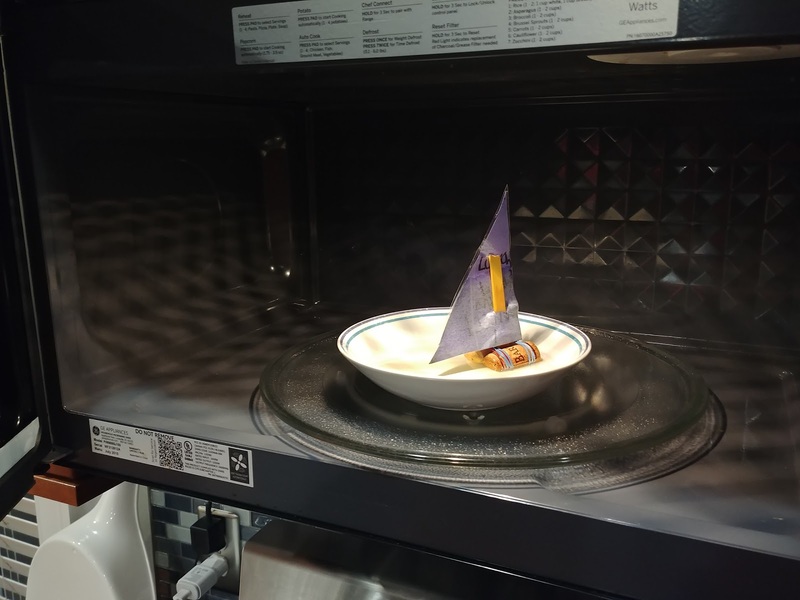 But the result was, after just a few minutes, a craft ready to set sail. After mulling over our hiding options, we decided to float the S.S. J.J. in a bowl of water in the microwave for Shira to discover. Action shot! 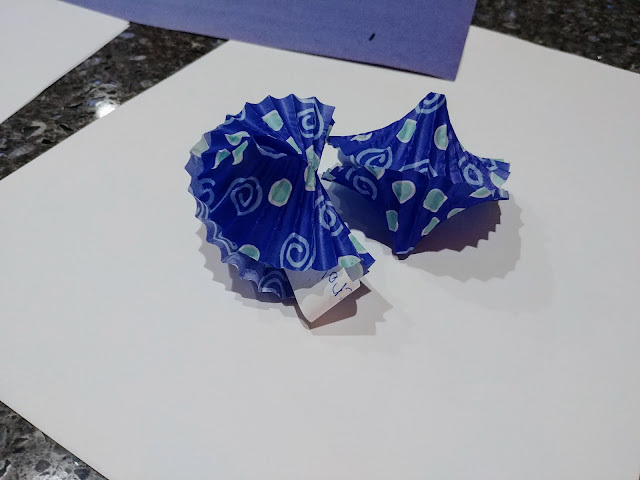 These were even easier than the boat to make: fold cupcake wrapper, tape and stuff in a strip of paper with a fortune written on it. For bonus points, add some lucky numbers on the back of the fortune. We had fun both making the creations, and watching Shira discover them. We haven't yet experimented with leaving art projects for the public to find, that's up next. While I'm a fan of nearly any kind of crafting, I think Sneaky Art is really on to something. When the topic of art comes up, we often focus mainly on mastery of technique. Sneaky Art gives kids (and really, anyone) a chance to focus on impact: how did your creation make a loved one or stranger feel? This is huge as it frames art as a tool to effect change, not just something you work to get good at. In other words, it's not just a tiny sailboat floating in a microwave, it's the seeds to change the world through the power of art.